Looking for older TankBot models? Check the TankBots Archive. 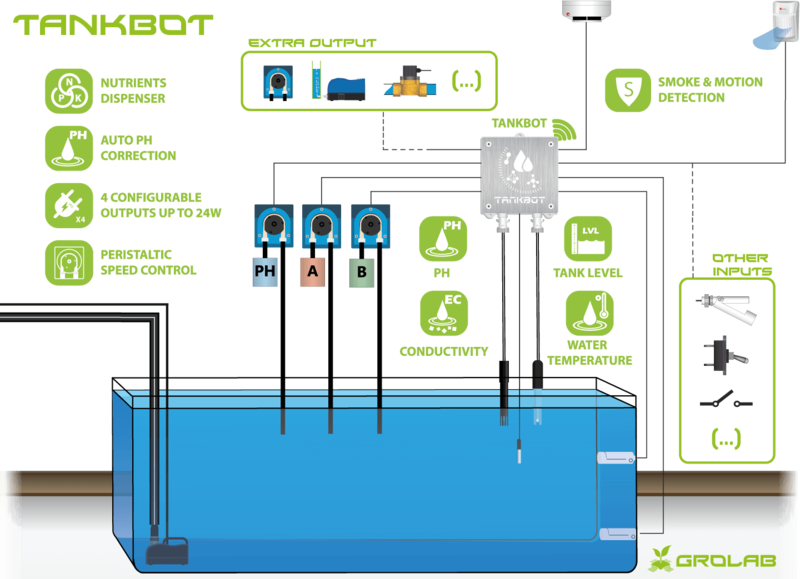 TankBot can provide power to all peripherals of your growing environment. It has 4 connectors that supports 12v actuators allowing a wide variety of devices like water pumps, solenoid valves, peristaltic pumps, relays, air pumps and power contactors. Using power contactors or relays extends the module capabilities to control any kind of device, providing a huge amount of options to automate a variety of systems like irrigation, lighting and air flow. In addition, TankBot provides an extra power output (12V/1A or 24V/2A), that you can use to power sensors like motion/smoke detectors, this output is not controllable working only as a power supply.